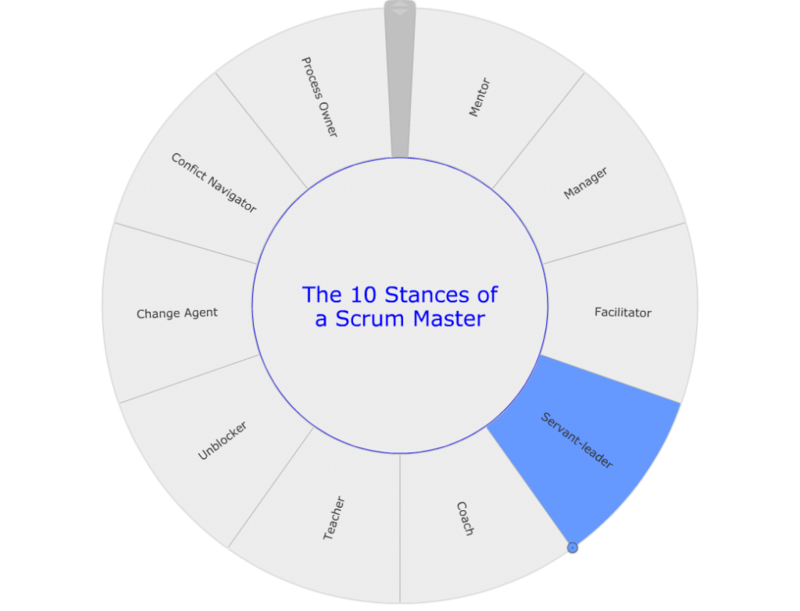 In a series of blog posts I will share the 10 different stances I consider to be relevant for the Scrum Master. This blog post is about the Scrum Master as a servant-leader. Servant-leadership is fully in line with the Scrum values of courage, openness, respect, focus and commitment. It's the backbone of the Scrum Master role and therefore the most obvious one to describe as first. It's a philosophy and a set of practices that enrich the lives of individuals, to build better organisations, and ultimately create a more just and caring world. It's a transformational approach to life and work that has the potential for creating positive change throughout or society. Servant-leadership focuses on collaboration, trust, empathy and the usage of power ethically. Robert K. Greenleaf, the originator of the term servant-leadership, describes a servant-leader as: "The servant-leader is servant first. It begins with the natural feeling that one wants to serve. Then conscious choice brings one to aspire to lead. The best test is: do those served grow as persons: do they, while being served, become healthier, wiser, freer, more autonomous, more likely themselves to become servants? And, what is the effect on the least privileged in society; will they benefit, or, at least, not be further deprived?" The servant-leaders objective is to enhance and increase teamwork and personal involvement. They create a participative environment, empowering 'employees' by sharing power and decision-making. The characteristics of servant leadership can also be found within the Agile Manifesto. The values ‘individuals and interactions over processes and tools’ and ‘customer collaboration over contract negotiation’ clearly emphasise the focus on collaborative engagements, serving others (the team members) and not yourself and boosting team performance by supporting individual growth. "Build projects around motivated individuals. Give them the environment and support they need, and trust them to get the job done"
"Business people & developers must work together daily throughout the project"
The Scrum Guide describes the Scrum Master as the servant-leader for the Scrum team. A Scrum Master is not master of the team, but a master at encouraging, enabling, and energizing people to gel as a team and realize their full potential. A Scrum Master is a servant-leader whose focus is on the needs of the team members and those they serve (the customer), with the goal of achieving results in line with the organisation's values, principles, and business objectives. Ensuring a collaborative culture exists within the team. By doing the research for writing this blog post I discovered that servant-leadership is a tremendous comprehensive topic. My goal was to describe the role of a Scrum Master as a servant-leader. Servant-leadership proved to be the backbone of the Scrum Master role. Its philosophy and practices increase teamwork and create an environment in which individual growth can flourish and endure. With this blog post I've only briefly touched the tip of the iceberg and gained a lot of new ideas to write about. When I've finished describing the other stances of the Scrum Master, I will definitely study and describe servant-leadership in more detail.